Among all of Bark River Knives, the Magnum Fox River is a favorite among sportsmen. Its sleek lines and absolutely perfect cutting angle make it an easy knife to love. This is one of the finest hunting knives you will ever own. Every sportsman should have a good multi-tool on them. 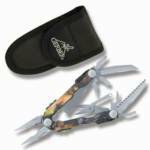 The multi-plier is 4 7/8" closed and made with all stainless tools. This tool comes in a mossy Oak Breakup camo finish on the handles. Tools include needle-nose pliers, wire cutters, wire crimper, partially serrated blade, large, medium and small screwdrivers, Phillips screwdriver, file, scissors, wood saw, can opener, bottle opener, and lanyard loop. SAF-T Plus locking system with an easy one hand opening system. Comes with a black ballistic nylon sheath. KAI Wasabi Black collection is a 7 Piece Knife Block Set. Now chefs can have the quality construction and design of Wasabi Japanese blades in classic European shapes. Each knife features high-carbon stainless steel blades. The 4 inch paring knife is suited for small fruit and vegetable work. The 6 inch utility knife is for in between tasks with medium sized fruits and vegetables. The stand out of the set, the 8 inch Chef's knife is the ultimate knife for nearly every task in the kitchen whether it's slicing meat or cutting produce. With a blade shape similar to a cleaver, the 6 1/2 inch Nakiri can handle tough chopping jobs. Each blade is held by a smooth, rounded, black handle that contrasts nicely with the brushed steel. Completing the 7 piece set are an 8 inch bread knife, sturdy kitchen shears, and a wooden knife block. 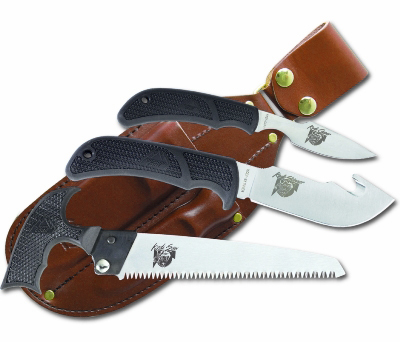 This is the ideal knife and saw set for field dressing, skinning, caping, quartering, or deboning big-game. Includes a 2 1/2" Kodi-caper, 4 3/8" Kodi-skinner, and 6" wood/bone saw with rubberized Kraton handles and AUS8 blades with full grain leather sheath. This Norwegian skinning knife is one of the best knives we have found to skin animals. 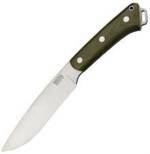 We have researched dozens of skinning knives over the years and this is our number one choice. This knife sharpens quickly to a razor edge and holds an edge for the longest possible time. The knife is 8 3/4" overall with a 4"Sandvik stainless blade. It has a curly birch handle that fits your hand perfectly while skinning and comes in a brown, leather belt sheath.